Selected as Collinsville's "Greatest Athlete"
The "Tulsa World" presented their list of "Oklahoma's Greatest Athletes" in the Sunday June 29, 2003 issue. Jim Thorpe was their choice for the entire state. They also make a selection for each Oklahoma community. 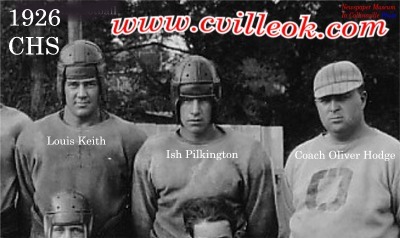 Their choice for Collinsville was "Ish Pilkington, 1927 All-State football player and all-decade 1920s, was among TU's greatest two-way players and is in school's athletic hall of fame. The first TU athlete selected to play in the Shrine All-Star Game." Based on all years of Collinsville sports coverage I've read in the archives of the "Newspaper Museum In Collinsville", I would have to agree with their choice. I would also like to open an email (and/or letter) discussion to gather names and accomplishments for other deserving Collinsville athletes over the years. Please send your opinion to Ted Wright for a future news item on www.cvilleok.com. To the right is Mr. Pilkington's wedding story which my grandfather used as another opportunity to brag on Ish's athletic accomplishments. 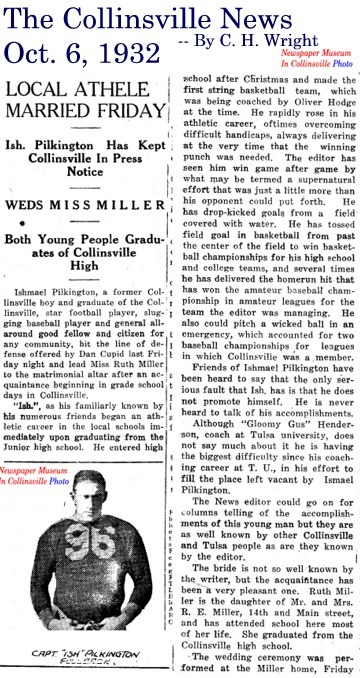 Pilkington was the key speaker at the 1949 dedication of Collinsville's new football facaility: Sallee Field. Ishmael Pilkington died in 1994. He was born in 1908 and moved to Collinsville when he was six years old. His father was Collinsville's Fire Chief for many years.